The joke is so old and repetitive – because the joke that is environmentalism and environmentalists is so old and repetitive. 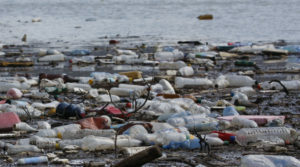 Time and again, nigh every time environmentalists gather to gripe about some fairy tale or other – or to simply listen to tunes, turn on, tune in and drop out – they have left behind an environmental disaster. Remember Woodstock? The 1969 Peace, Love and Narcotics concert in New York state? These “Love Your Mother Earth“Gaia worshippers – left the concert field looking like a nuclear trash bomb had been dropped. Ironic – given the Hippies’ “No Nukes” movement. Flash forward forty years. Remember Occupy Wall Street? That was the second iteration of the Left’s series of failed attempts to replicate the germane grassroots magic of the Tea Party (remember the Coffee Party?). Occupy’s chief complaint was against corporations (about which they vigorously complained on Twitter, Inc. and Facebook, Inc. – via their Apple, Inc. iPhones and Samsung, Inc. Galaxies). Of course a component of their anti-corporation sentiment – was that corporations are destroying the planet. They’re evil, they’re giant – and they mass-pollute. You know who definitely destroyed their little corners of the planet? Occupy Wall Street. “They…were…the 99%” – of the massive mess makers in their anti-corporate equation. They defecated and urinated on police cars. Because – classy. They lived in filth – and left it behind when they vamoosed. Leaving the corporations and straight-job-having-taxpayers they loathe to pick up the tab for their noxious tantrums. Has the Left finally learned its lesson? Have the planet’s alleged physicians finally healed themselves? Of course not. The joke then – is still the joke now. Behold the Dakota Access Pipeline protest. The environmental-disaster environmentalists gathered along the North Dakota-South Dakota border to protest a certain section of the aforementioned pipeline. And that gathering – was a donation-cash-cow. GoFundMe and FundRazr pages were established – and the coin rolled. Official Sacred Stone Camp – $3,125,550. Sacred Stone Camp Legal Defense Fund – $2,982,763. Veterans for Standing Rock – $1,155,770. Water Protector Legal Collective –$627,374. #BuildWithStandingRock Community – $537,555. Last Real Indians #NoDAPL Aid – $378,402. And on, and on, and…. $14 million for volunteer protesters – is a lot of coin. But it is way less than the $33 million taxpayers have already had to pay – to deal with the highly-compensated volunteer protesters. And along with the wasted money, thousands and thousands of civil servant man hours have been wasted babysitting them. If you live anywhere near this Leftist pipeline cabal and had to, while being robbed or assaulted, wait a whole lot longer for the cops to show – it is because they were diverted to dealing with this Leftist pipeline cabal. And taxpayers aren’t yet finished paying for this Leftist mess. Because the Leftists – left yet another mess. $6 million of the $14 million raised – went directly to the Standing Rock Sioux Tribe. The Indians protesting the pipeline. The coin was donated to allegedly address three things: legal fees for their lawsuits against the Army Corps of Engineers, waste management at the protest site – and to offset Indian casino gambling revenue losses incurred because of the protest they were leading. Get that last bit? They led a protest they knew would cost them money – and they had the audacity to ask people to compensate them for their self-inflicted wounds. The other two reasons for the titanic coin – make even less sense. Get that? The (again, taxpayer-funded) Army Corps of Engineers is being sued by the Tribe – and has to pay to clean up after the Tribe. While the Tribe sits on the millions it raised – putatively to pay for clean up. Again, the anti-environment environmentalists joke – is a very old one. It wasn’t funny then – it isn’t funny now. But it does make it nigh impossible to take environmentalism and environmentalists seriously.